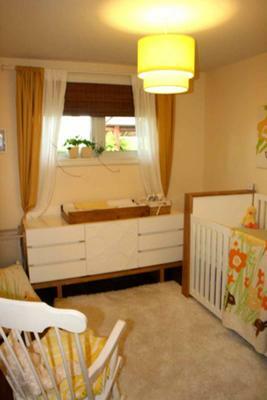 The white and natural wood baby crib looks amazing with the light yellow wall paint color. My husband made the diaper changing box on the dresser himself! 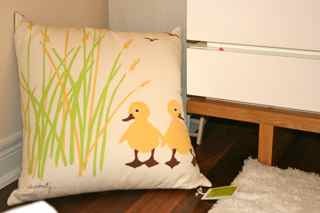 The yellow ducky pillow that was the perfect inspiration piece for my baby's tranquil modern nursery design. I knew that the Amenity Eco crib bedding set was the perfect inspiration piece for our tranquil, modern nursery ideas the minute that I saw it online. I had been looking for a piece of artwork or fabric or something to go by for forever. I just love the soft colours, especially the little, yellow duck on the pillow and quilt. These are just a few of the tranquil modern baby nursery ideas that we have for you! I also appreciated that it was neutral and would work with either a baby boy or girl which was a necessity since we didn't find out the baby's gender. 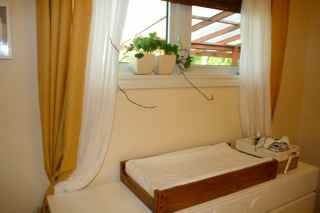 We left the walls a light, yellow colour, nice and fresh. 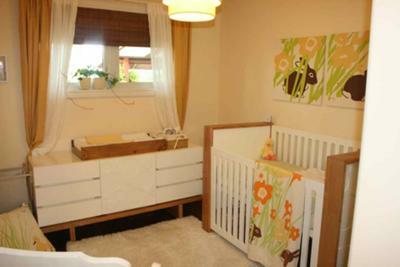 We decided to go with the Aerial crib and matching dresser by Nurseryworks. I love the look of the natural wood along with the white. My husband made the wooden changing pad box and it really looks great on the baby's dresser. A special piece of furniture is the white rocking chair that was my mother's. The baby's blanket, the yellow duck pillow and wall art were all from Amenity Home. I just added a green and white fitted crib sheet that I bought from Dwell Studio. There is a framed picture of my baby girl's tiny feet which was taken when Claire was just 5 days old. I actually picked up some fabric at my local fabric store and made my own window treatments! I just sewed something simple and then added a bamboo blind from Bou Claire to darken the room for naps, and to bring out the finish of the walnut wood floor. The white shag rug came from Ikea, and really warmed up the space and tied everything together beautifully. It was a great deal and cost only $50! The ceiling light is a great shade that I picked up at Homesense. Decorating the nursery and finding everything I needed to make it absolutely perfect wasn't easy, but I loved doing it. I love decorating, and I love the challenge of finding great things to make a room work. I hope that Unique Baby Gear Ideas' moms and dads have enjoyed seeing my baby's modern nursery design. If you are currently decorating and have a question, just drop a comment in the box! The yellow duck pillows are so cute! I can easily see why you fell in love with them. I already have bought the crib set and sadly I can't exchange it but I can draw a pattern and applique a ducky onto a square and make my own accent pillows! Thanks for sharing your pictures and giving me this idea.